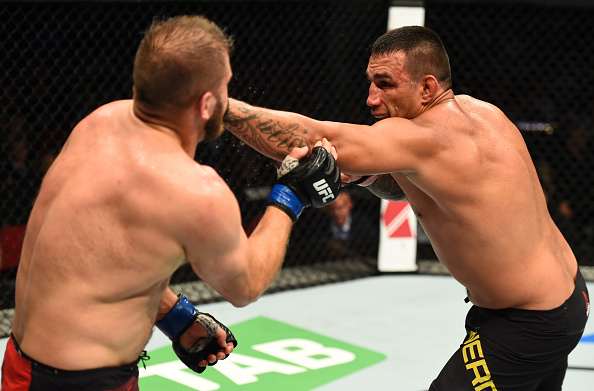 After going just 65 seconds in his last bout, former UFC heavyweight champion Fabricio Werdum got 25 minutes out of game Polish contender Marcin Tybura in the UFC Fight Night main event at Qudos Bank Arena in Sydney, but the winning result was the same for Werdum, who took the bout via five-round unanimous decision. Scores were 50-45 twice and 49-46 for the No. 2-ranked Werdum, 23-7-1, who replaced Tybura’s original foe, Mark Hunt. The No. 8-ranked Tybura falls to 16-3. Tybura frequently switched stances in the early going in order to throw Werdum off, but the Brazilian calmly moved forward, unbothered by the change in strategy. Midway through the round, Werdum kicked his offense into gear as he tried to land punches and knees at close range. Tybura got some shots in, but Werdum was cool in the spotlight he has known for so many years, and while his first takedown attempt came up short, he adjusted well as he pinned Tybura against the fence until a scramble allowed “Tybur” to reverse control just before the end of the round. The 40-year-old Werdum remained at ease in the second, but that was a risky tactic given the danger presented by Tybura, who scored with some hard kicks, including one to the head that got the Brazilian’s attention. In the closing seconds, Werdum upped his work rate, likely stealing the round and extending his lead. In the third, Werdum began putting more pressure on Tybura in spurts, and some of these brief barrages began to slow the Uniejow native down significantly, leading to a Werdum takedown midway through the fourth frame. While on the mat, Werdum smothered his foe, but Tybura was able to get back to his feet with 30 seconds left and even score a takedown, even though that takedown nearly got him submitted by a guillotine choke. Thirty seconds into the final round, Tybura nearly turned the fight around with a left kick to the head, but Werdum shook off the effects of the kick and got back to work. Werdum did eat another kick to the head nearly 90 seconds in, but again, he kept moving and scoring with an array of strikes, securing his second consecutive victory as he pursues a shot at regaining his crown.